I’ve always loved to tinker. 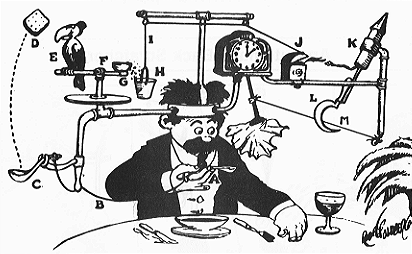 I was a fairly imaginative kid and use to build Rube Goldberg-esc machines as a kid for fun. As an undergrad at MIT, I would get together with a group of friends to discuss business ideas. We called ourselves the ‘breadwinners club’ (who knows if there was some subconscious chauvinism in that, but I assure you, none was intended) and considered many concepts: mobile payments platform, couponing website, location services, etc. We settled on an idea I had to deliver audio versions of print and digital articles based on a user’s preferences (think customized podcasts + content search + TTS engine). We made some decent traction, were trying to raise a round but ended up folding the business after about a year. Biggest regret, letting go of that team (Neal, Chris, Jason, Greg) – they were awesome. I then sold my soul and went into strategy consulting. Actually, very much enjoyed it – worked on exciting projects for big corporations. 5 years in, everything was going perfectly: good exposure to clients, rapid promotions, great teams… But had the entrepreneurial itch and had to scratch or I would forever wonder. (Silicon Valley will laugh at this next comment, saying it proves I’ve abandoned my west coast roots and become a true east-coaster) …so I went to business school at Wharton. Honestly, having been through a year, I disagree with all the web chatter about the ‘uselessness’ of an MBA for an entrepreneur (future post?). I had my heavy doubts, esp. about cost, but it’s been an awesome experience. The speed of which I have been able to make solid connections to heavy hitters has been amplified by my involvement with the school and my classmates. I wasn’t perfect, but most of my efforts were motivated by my potential goals (join a hot startup, start another company, or join a VC firm): became an officer in the venture capital club, entrepreneurship club, founders’ club; competed in the VCIC, SVCIC (went to international finals in both); worked sourcing deals for a West-Coast VC fund (Foundation Capital). I’ve spent my first months as Co-Pres of the eClub trying to link the various resources and communities in and around the UPenn campus and accelerate the start-up activity. The summer posed a difficult choice, but ultimately decided to take a VC job at Genacast Ventures and hack away at night on my current business ideas. Still unsure which side of the table I’ll be on upon graduation…stay tuned! Posted on May 20, 2011, in About, Venture & Start-ups. Bookmark the permalink. Leave a comment.